Born and raised in the United States to Mexican immigrant parents, Jacqueline (Jackie) Vela has often served as a translator. Her father works in an industrial metal lab while her mother, despite suffering from chronic back pain, works at home raising their three children. As the eldest child, Jackie grew up helping with housework and caring for her younger sisters—including her youngest sibling, who has autism and does not speak. Throughout Jackie’s youth, she was also the one to help her family of five navigate social services and access the resources they needed, living in South Los Angeles on one income. Even with her busy home life, Jackie loved school. Living in a low-income area, her peers rarely spoke about college. Fortunately, she was encouraged by her History and English teachers at South East High School to make bigger plans. “With my teachers’ positive mentoring and parents’ support, there was no question about wanting to go to college, but rather how to afford it,” Jackie said. She dreamt about studying at the University of California–Berkeley. With her strong academics and leadership experience as the editor-in-chief for her high school newspaper, the Jaguar Times, she was thrilled to be accepted. But life doesn’t always go according to plan. Jackie made the tough decision to decline her spot, so she could stay closer to home and help take care of her family. According to Jackie, navigating college while simultaneously helping care for her mom and autistic sister was no easy feat. For a child of immigrant parents and a first-generation college student, school seemed intimidating. She didn’t understand the system and felt she was going in blind. While at ELAC, Jackie served as the President and Secretary of the Puente Club, which works to help increase the number of educationally underserved students who can become community leaders. She was also in the Honors Program and many other organizations and, as a student mentee and researcher with the Loyola Marymount Undergrad (LMU) Research Academy, she earned first place for her research presentation. The November 2016 elections further fueled Jackie’s commitment to helping immigrant families. “Within my home state, I was proud to vote for women of color who defend and honor communities made up of hard-working, diverse immigrant families like mine,” she explained. Eight months later, she interned for U.S. Representative Nanette Diaz Barragan, who represents her home district in Washington D.C.
Jackie learned about the Dream Award Scholarship through a website called College Greenlight. “It was very humbling to win the Dream Award and I was honored to attend the annual event in Washington D.C. and meet so many accomplished scholars studying amazing fields,” Jackie said. “It helped support my dream to transfer to UC Berkeley where I am a double-major in history and literature. I am a little fish in a big pond, but my experience taught me how to find needed resources. I live in off-campus housing with a friend who also transferred to UC Berkeley from my community college. “When I first started at UC Berkeley, I had to deal with imposter syndrome,” she said. “It’s a feeling of self-doubt and intimidation that you’re not good enough. I worried that my writing would not be up to par with such a renowned university. I was proud to get back my first papers to see I did well. 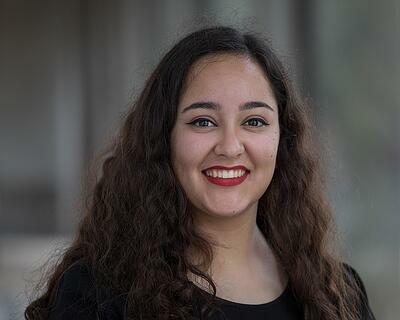 Now a junior, she plans to apply next year for the McNair Scholars State Program which helps first-generation and disadvantaged students pioneer and present their own research at a symposium, and support their path to achieving an advanced degree. Long-term, she aspires to earn a PhD and study abroad in London, an epicenter for history and literature.